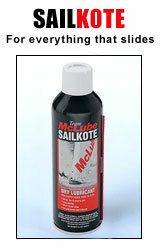 Team McLube: Innovative Dry Lubricants and Speed Polish for Marine and Recreational Applications—Sails, Hulls, Rigging, Travelers and More! 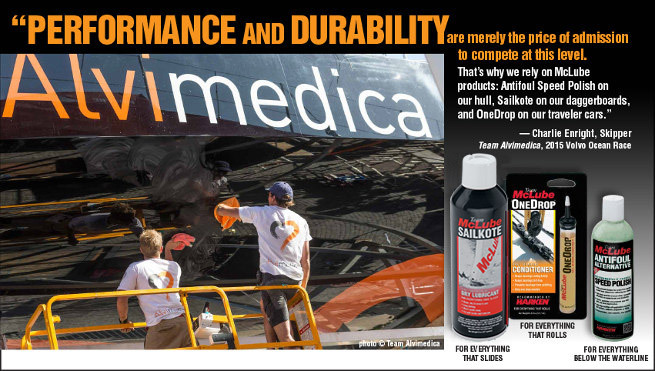 Sailkote is the high-tech, dry lubricant that makes sails, hulls, rigging, deck hardware, and anything that moves on your boat run smoother, work more efficiently, and last longer. 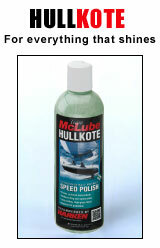 Hullkote combines the world renowned Mclube proprietary formulation of our bonded PTFE suspension system with a revolutionary citrus-based, long lasting high gloss hull polish. NEW from Mclube! OneDrop Ball Bearing Conditioner is the only product that Harken recommends for use on ball bearing travelers and battcars to reducing rolling friction. Team Mclube offers a trio of high-tech products designed to make everything that moves on a sailboat perform more efficiently and with less friction. Our products bond to the surface like a paint - lasting a year or more even in the harshest environments. 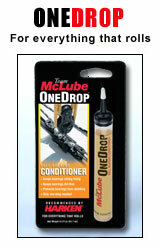 Designed to be dirt and water repellant to keep surfaces clean and friction free. A perfect solution for sails, rigging. hulls, sail tracks, genoa cars, batt cars, telltales, sliding hatch doors, and much more.